Philippos Hotel Apartments is a charmfull newly built hotel with studios and two roomed apartments located in Nikiana village in the greek island of Lefkas. 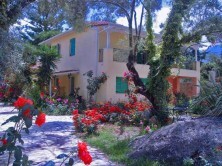 The complex consists of 4 independent buildings surrounding a beautiful flowered garden and old olive trees. There is a main building that includes: reception, breakfast room, cafe lounge with terrace and TV corner, the bungalows building and 2 new residence buildings. Philippos Hotel Apartments contains a total of 17 studios and 12 two roomed apartments offering the best accommodation for your holidays in Lefkada. Facilities upon request: Rent a car, motorbike or boat. Transfer to or from the airport, Taxi service. Our aim is to ensure that you have a comfortable and enjoyable stay in Lefkada!